Our new Epson “FastFoto” scanner sucked in photos so fast it made us laugh. Put a stack in, and the photos jump through the scanner like they’ve been shot out of a cannon. Typical speed is one a second. A scanned photo, sent by email or shared on Facebook, is often a spur of the moment thing. Reach your hand into an old collection, pull out a stack and put them in the FastFoto scanner. Within a few seconds, they pop out, enhanced if you wish, red-eye removed, and uploaded to your private account on Dropbox or Google Drive. And oh yeah, saved to your computer. The scanner scans both sides at once, which is kind of crucial. Because many times we, and we’re sure many others, have looked at an old photo and said “who’s that?” So it’s worthwhile to jot a note or two on the back of your prints. We did our scans with the Epson “FF-640,” which is similar to the latest version, the “FF-680W,” but cheaper. 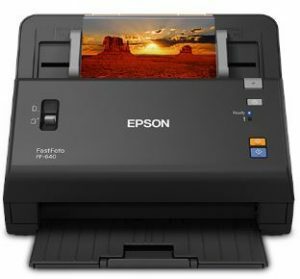 We saw the FF-640 at Epson.com in a refurbished version for $414. What’s the difference? The older model can scan 300 dots per inch (dpi) or 600 dpi; the higher number may require two seconds per photo. The more expensive model has a list price of $600 and can scan up to 1200 dpi. High resolution scans like that might be useful for museum archives, detective work, or printing posters, but wouldn’t matter for normal use. The 300 dpi setting is great for sharing photos online, because the file size is smaller. Also, at 300 dpi each one is scanned in a second. An Epson rep told us a big advantage of the more expensive model is that scanned text is searchable. This would be particularly useful for law firms, libraries and many businesses. One last comment on so-called “refurbished” items: We only had trouble with such buys once, and that was because the hard drive on the computer still had someone’s files on it; there was nothing wrong with the computer itself. If you’re not afraid of offending your friends, you can earn up to $50 a month by allowing ads inside your text messages. It’s a free app called “Slam Ad,” available in the Android or iPhone app store starting in November. Once installed, it will pay you a tiny amount for every text message you send. Sounds intrusive, but the ads are short. A few lines of text include a coupon, discount code or announcement that ties in with the conversation. If you’re texting about a movie, for instance, you might see an ad for popcorn and soda. If you’re meeting someone for coffee, you might see a Starbucks coupon. As the text sender, you can redeem your earnings for cash, gift cards or a savings account for college tuition. A reader tells us that her Instagram account was hijacked, and all 1700 of her posts, including private photos, made public. Her profile picture and user name had been changed so that the photos appear to be coming from someone else. Yikes! Even changing her passwords had no effect, nor did writing to Instagram, or its owner, Facebook. If you want to backup all your photos and videos on Instagram to be on the safe side, here’s how. 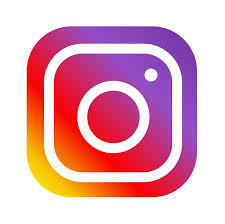 Go to Instaport.me, iDrive.com or Digi.me and try their Instagram backup feature. In a blog post, Instagram suggests revoking access to any suspicious apps that may have access to your account. What’s suspicious? Even paranoids can have enemies.